Cannon Cliff in winter, a study in shades of gray. 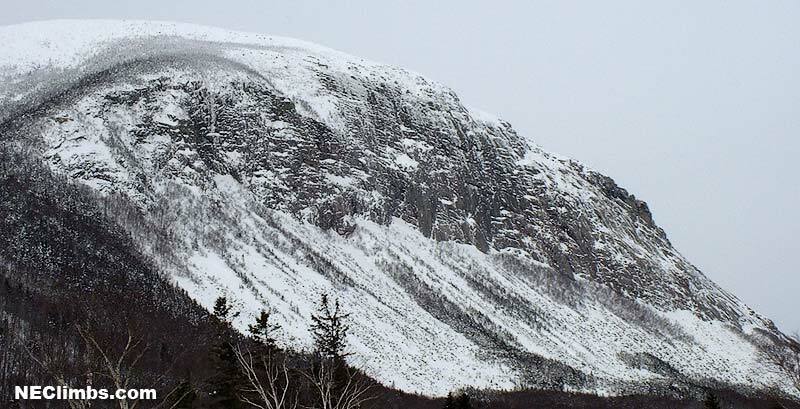 Description: The alpine rock and ice training ground for New England climbers since the 20's. Between Cannon Cliff, The Eaglet, Eagle Crag, Hounds Hump Ridge and other crags, every kind of climbing you want or can imagine is represented. While many climbs are rated as moderates, make no mistake, the committment level here is very high. If you have a problem you are often on your own, in spite of the fact that the busy Interstate highway is in plain view below. The weather is extremely variable and often you can't see what's coming in from behind the cliffs. On top of that the rock quality can range from superlative New Hampshire granite to choss, and everything in between. That said, a day on any of the Franconia crags is a day well spent. Directions: It doesn't get much easier to get to, I 93 goes right through the middle of Franconia Notch.